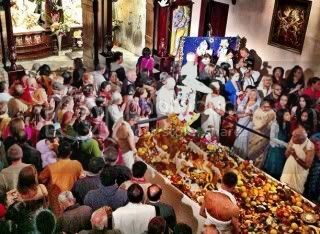 This year Govardhan puja and the secular (slightly religious) holiday of Thanksgiving (in the USA), are celebrated during the same month, and are only days apart due to the Vedic extra month coming in autumn. Although it must have occurred before, this is the first time I remember this happening. As a result of this unusual juxtaposition, I have naturally compared the spirit of both days. While there is some similarity with the idea of giving thanks for the bounty of the Earth in a very basic, down to earth way, Govardhan puja also has a deep philosophical meaning. Conventional thinking about religion merely colors our human life with a Godly brush, rather than placing God in the center by endeavoring to love, serve, and please Him on His terms as the goal of life. Thus, the tendency of ordinary religionists is to see God as the order supplier and giving thanks when our desires are fulfilled, is a bit one-dimensional and problematic. When the good times roll, and we have an abundance of stuff, or things to consume, with ideal conditions in which to be peaceful, happy, and enjoy material prosperity, then God is good. However, such persons can be greatly challenged when it “rains on their parade,” or their home, job, possessions, family or nation, etc., are destroyed or damaged, or killed or injured. They may question why God is “doing this to them,” not having knowledge that the nature of the world, being an artificial plane for the soul, is problematic and unnaturally temporary for the eternal soul. Others are able to tolerate reverses or problems—or these days, trying to be a martyr in response—with the promise of a future happy afterlife in heaven. This is still promoting the same materialistic perspective of seeing this world as meant for material enjoyment, just putting it off for a while. The previous chapter to the beginning of Govardhan puja shows how “smarta” (not too smart actually!) 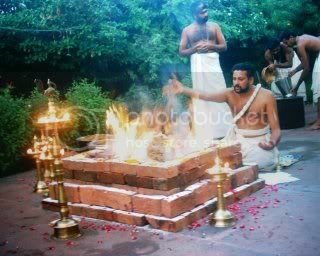 brahmanas, were performing an elaborate and technically difficult Vedic sacrifice with the purpose of going to heaven. Unfortunately, their material consciousness focused on getting, prevented them from appreciating the Divinity of Krishna and His brother Balarama, along with Their devotees. On the other hand, their devoted wives, being blessed with spiritual feelings, were willing to give up everything to give food and their very lives to please the Lord. Better a heart of devotion compared to an ocean of materially motivated so-called knowledge. The Govardhan “lila” (divine play) further outlines the materialist religious mentality of trading something, to get something. However, from a higher perspective Krishna teaches us that material happiness and acquisition doesn’t bring us closer to the soul and it’s Source. Even regular people know that the best things in life are not things. The soul, or consciousness, as the experiencer or animator of the world, is much more important than stuff, or matter. In other words, matter wouldn’t matter without consciousness which thinks about, feels about, and animates physical bodies and objects. The body requires water, but the soul needs spiritual food. While there is material starvation, of more importance is spiritual starvation, since even with all material necessities provided, the soul will still be dissatisfied. Ordinarily we think we will become happy and improve our lives by adding things on, when actually, it is just the opposite: by letting go of the spirit of material accumulation, which means becoming free of the consciousness that we are the owner and enjoyer of the world, we will experience the joy of the self, unencumbered by the external coverings of the flesh (worldly desires)—which are like weights keeping us Earthbound. Selfishly acquiring, contracts or restricts the soul by making it more like matter. However, giving or sacrificing for others, and especially for the Supreme Soul, Krishna, expands our soul to new heights of our Divine potential on the road to God realization—which means being awake to our spiritual selves. The true nature of our soul is loving service to God, or being one in purpose to our Source. The Govardhan lila begins by outlining how Krishna’s cowherd family was engaged in a local custom to satisfy Indra, through a certain Vedic fire sacrifice (trading things like ghee and grains for some result). 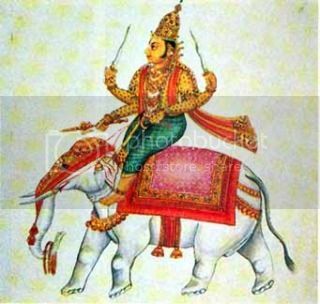 Indra is the “god” (empowered being, or “Lord”, which means controller ) of the rain—actually he is the “king of the gods.” The purpose of this ceremony was to receive rain, so essential for agriculture and cow protection. Krishna, as a very mature seven year-old, charmingly and intelligently questions His father about the nature of this Indra-yajna (sacrifice to Indra). Who was it meant for, how was it to be performed, and what results were expected? Was it a recommended activity given in the Vedic scriptures or was it more a local custom? 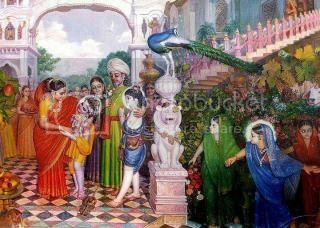 His father, Nanda Maharaja, who was the king of the cowherd people, hesitated to answer Krishna, thinking him too young to understand, and that this practice was mainly a religious ritual not very well thought out. Since Krishna wanted to establish the fact that His devotees need not worship anyone other than God, He gave arguments against the Indra yajna from various writings in the Vedas, even materialistic or atheistic perspectives. 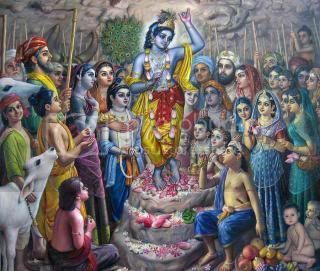 However, more than the exact reasoning Krishna gave, his father and the villagers agreed to Krishna’s proposal to stop the yajna, and worship Govardhan hill, more because of their love for Krishna and wish to please Him. This is natural for parents, though on another level it is also natural for souls to want to please God. Krishna also wanted to curb the pride of His servant, Indra, who had become intoxicated with his deputed power, forgetting that God was the source of his prowess. Krishna doesn’t like His devotees to be proud, knowing that such an attitude isn’t favorable for serving Him. With the worship of Govardhan hill and the brahmanas, and the subsequent curtailment of the Indra yajna, Indra became enraged and tried to destroy Nanda’s village and his subjects and cows—completely losing his senses, and acting like a demonic person, rather than a Godly one. I am out of time to further elaborate, but Krishna lifted Govardhan hill to protect His devotees, and Indra’s pride was smashed. We learn in this pastime, that we need only worship under the direction of Krishna, for His satisfaction, without worrying about material results. Everything comes from loving devotion, or bhakti. Gratitude for our many blessings can be the beginning of our spiritual journey, though it shouldn’t stop there. We have to also understand our spiritual nature as souls and our loving relationship to God, who for Gaudiya Vaishnavas, is known in His original form as Shri Krishna. Our true prospect likes not in material adjustments, possessions, or facilities, but in acting, thinking, and feeling in such a way that we become Godly in full love for Him, and go to Krishna's spiritual abode at death. This is what the process of bhakti yoga or Krishna consciousness is all about, and is the greatest gift to humanity for which we can be thankful.